Ranveer just inaugurated something special on his name and we are super thrilled! Amid getting jealous of all Ranveer Singh’s posts from his Switzerland holiday, we have a super exciting news to share about the Padmaavat star. 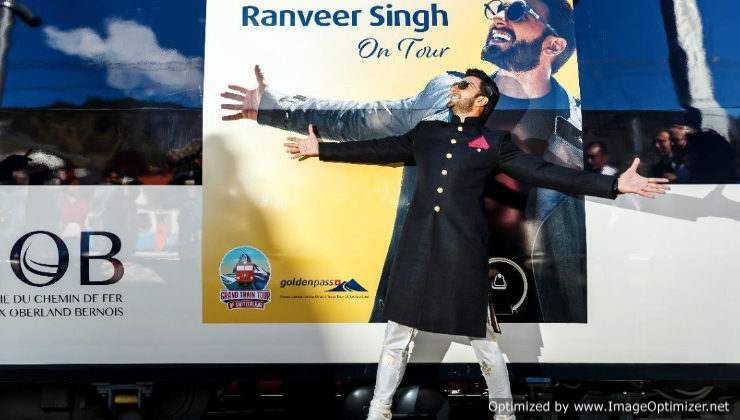 Ranveer just inaugurated a ‘Ranveer on Tour’ train in Switzerland. The train honours his contribution to the increasing popularity of Switzerland. Indian tourists have been preferring the destination over others in the past and the tourism team believes it is because of Ranveer Singh. Martin Nydegger, CEO o the Switzerland Tourism believes that the Indian market is fundamentally important for them.He said, “In 2017, activities to promote Switzerland in India have resulted in a strong increase of 23.4 percent in overnights.” Their campaign with Ranveer Singh as brand ambassador has contributed to their success. With this train named after Ranveer Singh, the team is hoping for a further increase in the market with more Indian tourists. The train has pictures of Ranveer Singh all over. The train ride will offer a spectacular view of the changing landscapes of the Lake Geneva Region. Next, it will pass from Montreux, through the Unesco world heritage vineyards of Lavaux and the Jura mountains to the Bernese Alps. Koffee With Karan 6: Shah Rukh Khan, Salman Khan, Katrina Kaif To Appear Together? Sonam Kapoor Ahuja Spill The Beans On Sis Rhea Kapoor and Karan Boolani’s Relationship. Previous story Divyanka Tripathi tweeted ”Baby On The Way” and people are going crazy!